I discovered this ancient photograph hanging on the wall in a downtown Starbuck’s. 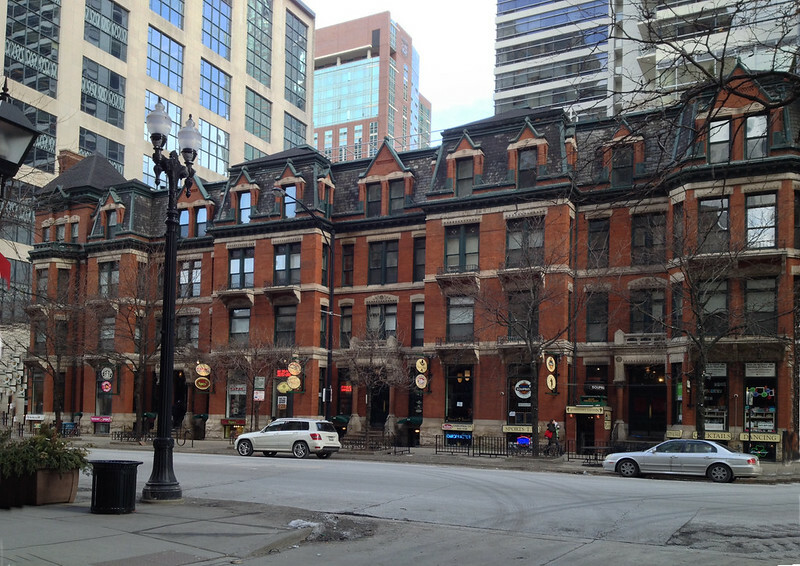 It shows the Hotel St. Benedict flats, a Victorian era apartment building erected in 1882 at 40 E. Chicago Avenue. All too often, I find photographs like this and sigh wistfully, shaking my head that such a building could be built, and that it could be demolished. 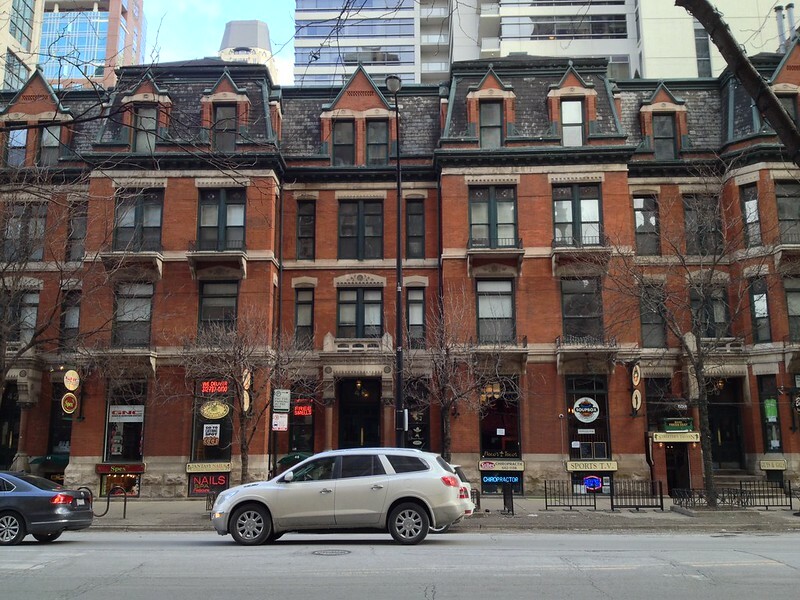 In this case, however, I decided to step outside and reproduce the photograph, since the Starbuck’s in question is inside the Hotel St. Benedict Flats building. 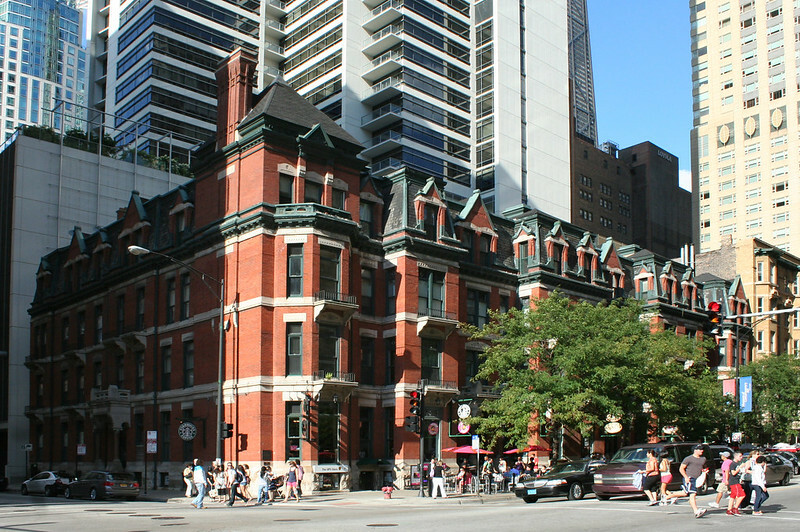 Astute readers will notice that the building lost its Wabash Avenue wing at some point – compare the number of dormers and entry canopies. 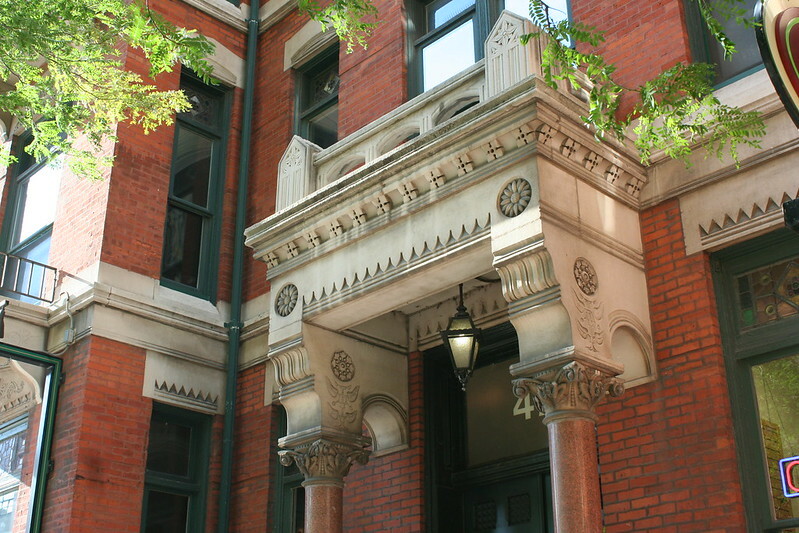 If I had to pick a favorite block in downtown Chicago, the St. Benedict apartments would be on the shortlist. A generous sidewalk, a healthy dose of shade trees, and plenty of outdoor seating, only steps away from a variety of major attractions, make this a popular low-key resting and gathering spot for locals and tourists alike. And then there’s the building itself. Such articulation! The massing of the building steps in and out as it goes along, but that’s just the start. Stairs climb up and down from the sidewalk, leading to chain sandwich shops above and basement bars and nail salons below. Life on the sidewalk, above it, below it: the perfect urban setting. 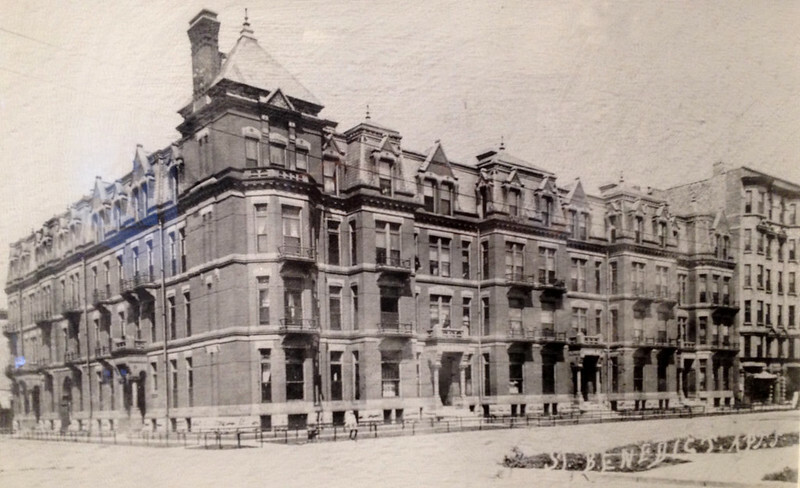 The Hotel St. Benedict Flats are not stylistically pure (the mansard roof with its copper trim is borrowed from the Second Empire style) but primarily it follows in the same Victorian High Gothic vein as Frank Furness’s buildings and Louis Sullivan’s earlier works. Characteristic details include flat stone elements with incised designs, both floral and geometric, and the polished stone columns supporting the massively oversized entry canopies. 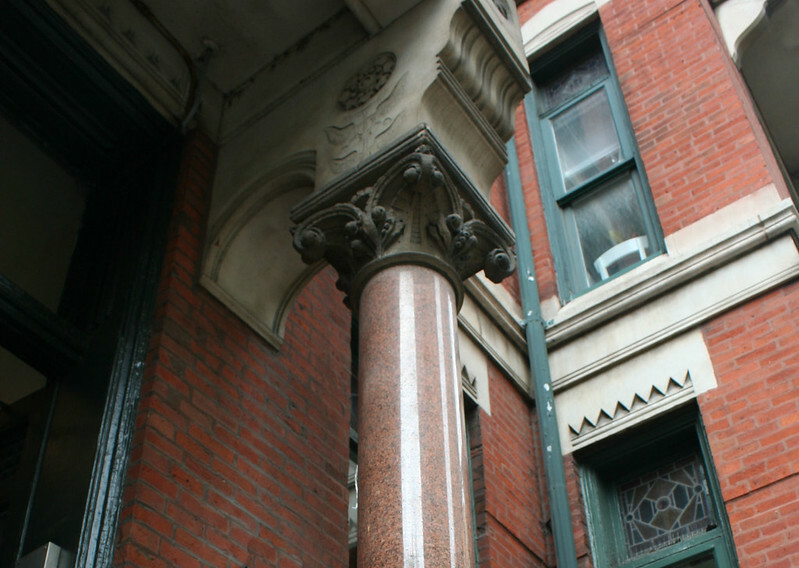 Massive weights bearing down on undersized columns is a recurring theme of High Victorian – see the entry of St. John Cantius Church, for example. Elegant Apartments of 7 or 9 rooms each…complete with steam heat, gas fixtures, mirrors, mantels, garbage and ash shutes [sic], and every convenience. After its initial burst of marketing in the 1880s, it settled into a quiet life. In 1922, 6-room units were renting for $82.50 a month; a threatened 25% increase sparked a battle between the tenants and owner. A small 1923 fire forced 50 families out into the January cold for a night. Two different betting operations were busted in the basement storefronts in 1948. A parade of ordinary Chicagoans seems to have lived there: a World War II vet and a YMCA worker appear in various mid-century articles. The building presumably trended along with its Near North Side neighborhood, which suffered post-War malaise and decline, followed by a gallery- and retail-based revival beginning in the 1970s. The building was purchased by David “Buzz” Ruttenberg in 1980, who found it in run-down shape and had little interest in sinking money into it, given its size and condition. In light of the tremendous real estate boom on and around Michigan Avenue, in 1986 he applied for a demolition permit (alongside the Esquire Theater, which he also owned and whose Moderne interiors would be gutted in 1989), triggering a preservation war which would last almost a decade. The city landmarks commission rather inexplicably denied the building City Landmark status twice in the late 1980s. The building was in dire straits by 1990, when Ruttenberg had designs on its demolition and actively opposed landmarking the building (stating that the building’s commercial tenants had “changed this building dramatically. It’s not pristine. It’s unfit to be a landmark. It’s just an old building.”) Loyola University considered purchasing it to replace it with student housing; Ruttenberg wanted to put a parking lot on the site. 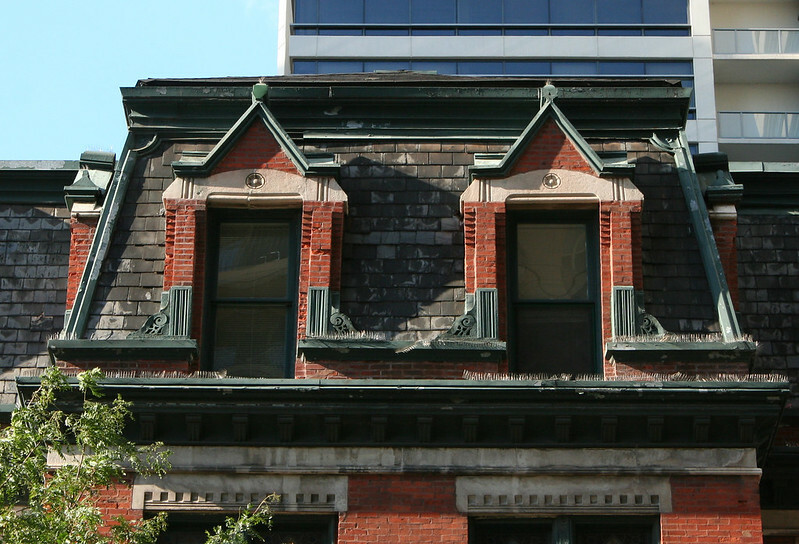 Preservationists refused to give in, however, and eventually a deal was reached. In late 1994, Ruttenberg announced a $2 million plan to renovate the building, in a project led by historic properties developer Bruce Abrams. Working with the Landmarks Preservation Council of Illinois, the developers arranged a tax credit on the foregone value (ie, the additional money they could have made by demolishing the St. Benedict and building something new and bigger) that made the project viable. It’s hard to argue with the results! 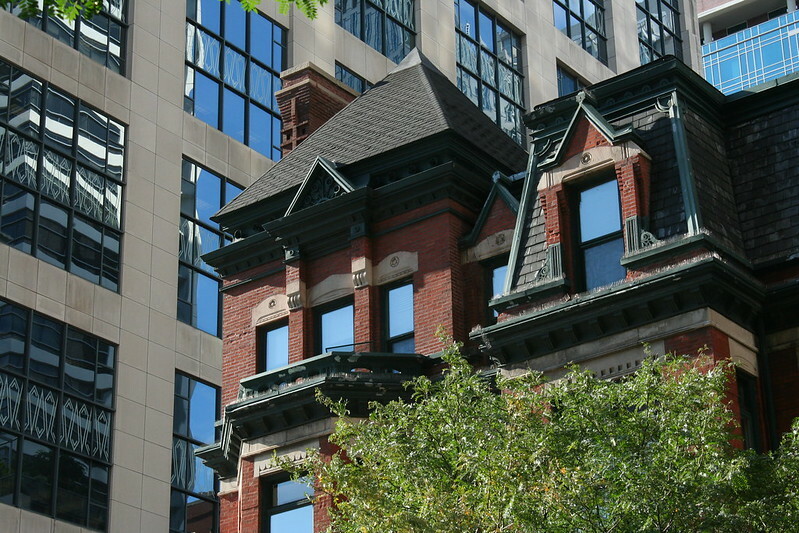 The building today continues to host rental apartments, now modernized and renovated. 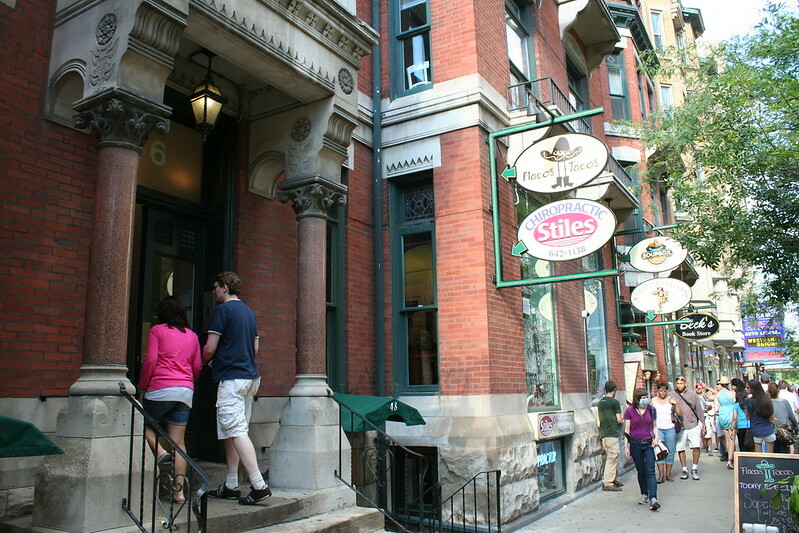 Below, the storefronts are thriving, and the city retains one of its finest old buildings amid the bustle of downtown. 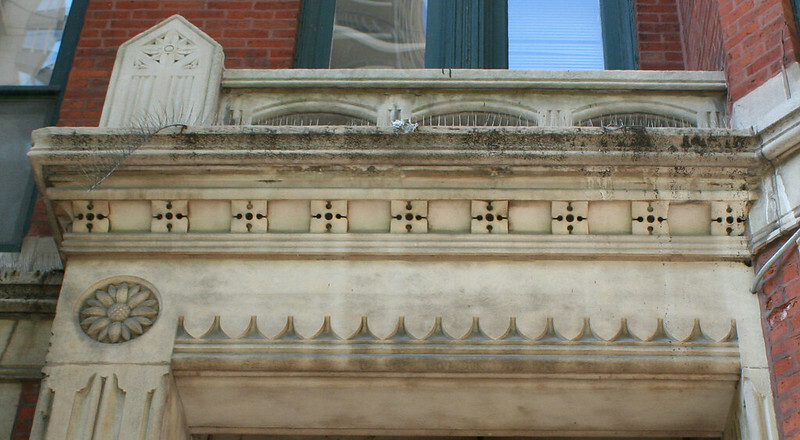 This entry was posted in Preservation & Renovation, Victorian architecture. Bookmark the permalink. 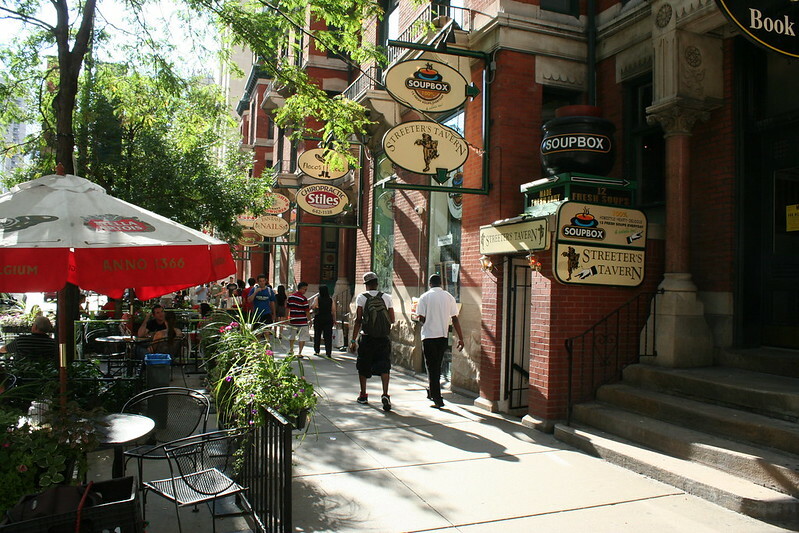 How have I missed this beautiful street when in Chicago? Thank you for another interesting post! One of Chicago’s finest buildings EVER! Thank you for caring. I arrived at your blog while I was looking for a photo for the novel that I’m writing: of grand old houses, of this era, side by side, with bay or bow windows, that were converted to apartment buildings in downtown areas of cities, and used in 1980. Please let me know if you have anything that might be useful to me.